Approaching Abstraction is a group show that showcases a movement amongst Mexican artists towards abstract and more monochromatic works. It runs concurrent to Bosco Sodi’s exhibition, Heavens and the Earth. Sodi is the founder of Fundación Casa Wabi, a foundation that supports the development new opportunities for contemporary art in Mexico. He co-curates the exhibition alongside Casa Wabi’s former chief curator, Alberto Ríos. Presenting work by nine Mexican artists working across a variety of different mediums, the exhibition is divided into four themes: time, architecture and landscape, historical commentary and socio-political critique. Performance artist Galia Eibenschutz’s pastel drawings are a combination of dance and draftsmanship. Documenting the sequence of movements of her body makes within space and across the passage of time, her ‘instants’ - on view here as a triptych - were all completed as part of the same performance. Time can be seen and heard in the work of Tania Candiani. Sobra el tiempo (2008), an installation of 240 ticking alarm clocks is an early example of her research into time as a construct. Benjamín Torres’ Imported series of collages are a comment on the social implications of the neoliberal economic policies in Mexico. 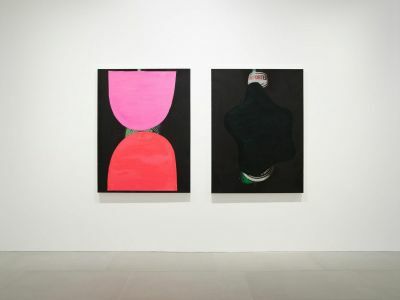 The works in the exhibition depict two Heineken adverts almost obliterated by paint, a reference to the sale of the Mexican beer company Corona to the Dutch brewing conglomerate Heineken International. The collage Hombre Murciélago (Bat-man) by Francisco Muñoz highlights the tense relationship that exists between the pre-Columbian beauty ideals extolled in historic paintings and murals, and their counterparts in today’s foreign mass media. Muñoz’s work is a reflection of the wider interest in critiquing archaeology and official history that underpins the ideological construction of national identity in Mexico. The way history has been written, appropriated and constructed in the country is also the basis for the sculptural practices of Tomás Díaz Cedeño and Cristóbal Gracia. Camina by Tomás Díaz Cedeño makes a direct reference to a vocabulary rooted in daily Mexican life, replicating marginalised systems of belief and the ritualistic processes around them. Erizo Acapulqueño draws on the nostalgia for Mexico’s modernist era centred around visions of Acapulco in its heyday from the 1950’s to the 1970’s. He questions the post-colonialist Hollywood vision of an exoticism that served as a counterpoint to the ideals of modernity at the time. Participating artists: Tania Candiani, Tomás Díaz Cedeño, Galia Eibenschutz, Cristóbal Gracia, Isauro Huizar, Daniela Libertad, Fabiola Menchelli, Francisco Muñoz and Benjamín Torres.